This documentary film represents a scathing review of American President Barack Hussein Obama Jr via a mashing together of video clips which attempt to tell a story. Allegations that Obama is nothing more than a CIA plant spawned by the Brzezinski clan. There are also claims that Osama Bin Laden wasn’t killed in Pakistan, and the crime scene was destroyed. 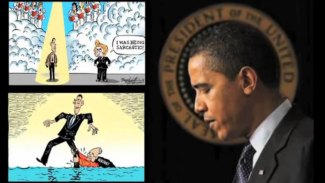 Video of Obama showing his disdain for American energy usage. Seems in his mind we’d be better off walking instead of driving. Keep in mind that Obama isn’t an energy specialist, has no brain, and has never held a job. Video of Obama admitting he frequently used illegal narcotics was also shown in the video alongside him championing the concept of “The New America Gangster”. Obama has not change from the policies of George Bush, he has radically expanded them, along with the financial indebtedness of the United States. Not to mention the call for a private army of 1 million to serve as domestic police state force.